If you feel that everything around you is boring and monotonous, and that feeling makes you want to change or leave your job/work, or maybe go on a vacation, do yoga, meditate etc. Then, you are probably one of those Creative Individuals, trapped in a monotonous job, who has not yet answered the call of creativity coming from within. Whoosh ! that was long. Creative individuals need expression to survive and NOT Suppression. If you have been constantly suppressing your creativity then you might be committing a big mistake. Give your creativity an outlet via some medium, like photography, art, music etc. or you might end up panicking one day and take wrong and drastic decisions to fix things. You must have thought about it but certain Thought Barriers must have prevented you from taking the first step. I have a 6 day a week job, I don't have time for it. I do not have enough money for that painting class course. That photography course is really lengthy and the cameras are very pricey. I don't work for an Ad agency, why should I explore creativity at all. I will explore creativity only when it is required in my work/job. Creativity... people might laugh at my work/ideas...as it would be non-standard. Creativity... there is no fixed definition of it, what is the point chasing it. Why waste time in a developing a hobby, I could make even more money in the extra time I take out each day. A complete mental breakdown, due to lack of variety in life/newer thoughts/ideas that refresh and re-energize the mind on a regular basis. Or You may suddenly give up your work/job entirely and decide only to follow your creative passion, be it music, painting, art or photography. Not the right move. So, a better thing to do would be, that one keeps expressing his/her creativity in some portion(a little, from time to time) along with their work. Be it once a week or maybe once a fortnight. This keeps everything going. You, then do not need to take drastic steps to fix things. **Self Expression is key to Mental and Emotional well-being. If you are able to express your thoughts or unspoken words via some medium on a frequent basis, then there is no need for any yoga, meditation, vacations to refresh yourself. Your mind will automatically be cleared of unwanted thoughts and will remain fresh/charged for other routine works. If you are guilty of not giving yourself the time to explore your inner creativity? Then don't worry, for I will tell you an easy way to express and connect with your creative self. And that way is, Minimalist Photography !!! So now, you may ask why am I claiming Minimalist Photography to be a better and an easier medium to express creativity than most other mediums? You don't need to take out loads of time from your busy schedule for it. Even if you decide to shoot on Sundays(like how I do) or once every 15 days, it is sufficient. 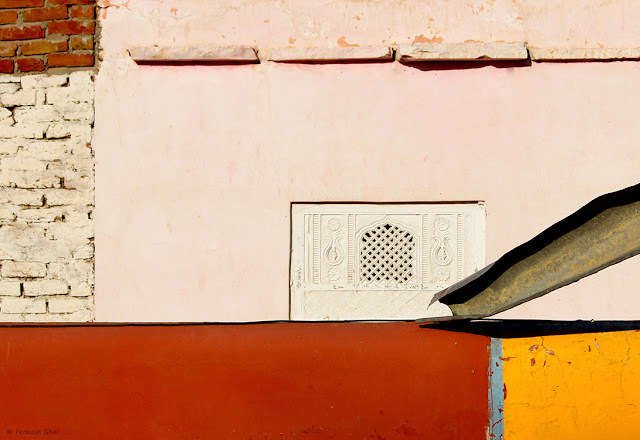 Simply read this article What is Minimalist Photography? to begin your journey. Note: You don't need to travel to specific places to take photos, because subjects are available everywhere. See post Radiate Love where something as plain and vanilla as a white wall with just a simple geometric shape can be a great subject. You can create subjects of your own combining different lines and patters/angles. See Example: Subconscious Expression. All that you need to do is See Shapes, and shoot them. For, in Minimalist Photography the elements represent their core shape/essence. Just make them speak for themselves. You can create thousands of different frames, just by moving your body from one side to another, or by bending or taking shots from top. You don't need to buy expensive cameras for it. You can manage shooting from a point and shoot camera or even a good camera phone like Apple iPhone6 or Samsung S6. I personally shoot from SamsungS6 and I both love and hate it. Don't ask me why. You can also shoot during lunch breaks. Yes, just floors, doors, windows, walls. All these are subjects. This photography is for all age groups and for professional and non-professionals both. Basically it is for everyone. Painting, Music and other mediums of creative expression might take months to learn. But Minimalist Photography is something you can begin tomorrow morning. We all are used to taking photos at occasions like birthdays, vacation trips etc. We are already familiar with the camera, aren't we? 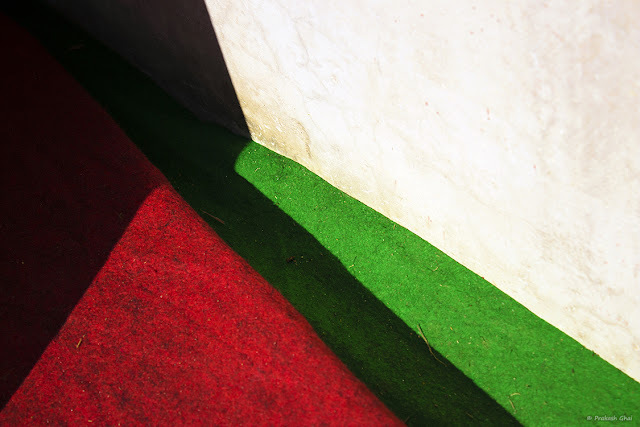 Minimalist photography is more of visual art and compositions using basic elements. It has very little to do with advanced technical camera knowledge and equipments. Here, you just need to do the basics right. Since 14 also doesn't feel right to end at, I thought it would be a good idea to ask the readers to sign up via email for the post updates, via point 15. Well, there is small box (with Email Address...as text pre-filled in it) on the Top Right of the website. Enter your Email address there and press the Submit button next to it, to get regular updates from our website. OK, now that I have claimed that Minimalist Photography is easy and the subjects are available everywhere, lets take a couple of examples. Explanation: As you can see above, there was practically no subject available. I just created one for myself, out of the very boring floor carpet overlap. This is the fun part in Minimalist Photography. Explanation: Staircases are another one of those very common subjects, that one can probably find almost anywhere. So next time, be on the lookout of staircases. Maybe, you need to avoid taking the lift (and that would also help you shed some extra pounds), for a change. OK, lets get back to the photo. The key subject here is the Blue Line i.e the side rail of the staircase. This blue line is in complete contrast to the monochromatic white structure, and that is precisely what prompted me to take the photo. 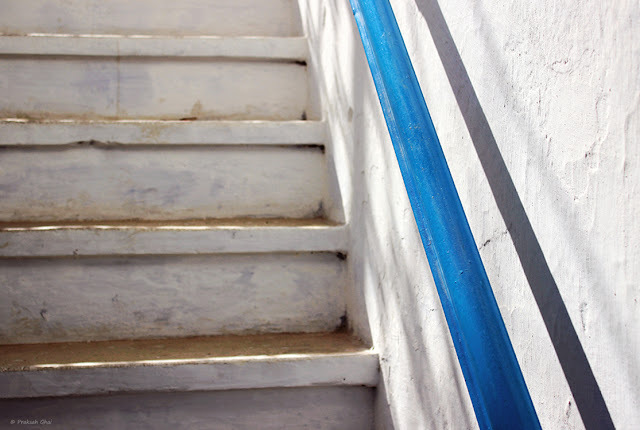 To compose, I placed the blue side rail, on the right of the frame and the horizontal lines of the staircase, were left to fall in place on their own. One can not be perfect with all the shots. Accept that. Likewise, note that I could not manage to keep all the horizontal lines of the staircase steps, straight. But it is OK. Minimalist Photography is not about perfection. 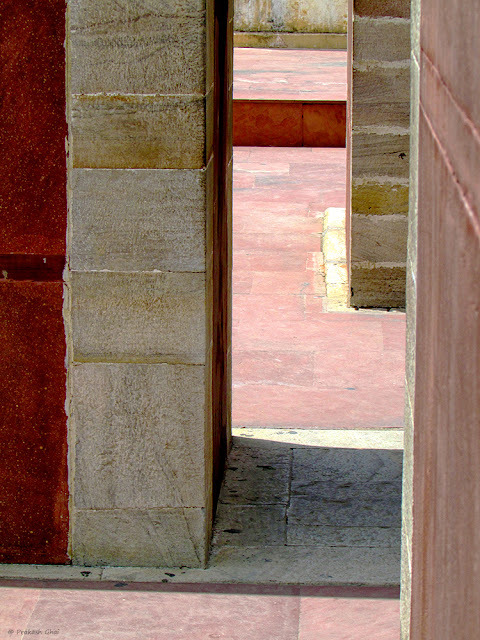 It is more about the arrangement of few elements within the frame using varied angles and combinations. The challenge is to keep everything simple yet interesting. Incredible visual clarity and letting the shapes speak for themselves is key to this art form. Lets Conclude: Aren't the two photos examples shown above, really to click? Was it very difficult to find the subjects? Well,this proves that Minimalist Photography can give your Inner Creativity, the WINGS it needs to fly. Just go out there and shoot. The subjects are unlimited and the number of frames you can produce, are simply infinite. True Story: This story relates a lot to me. I own and run two retail stores in my city and work 6 days a week. I dislike the monotonous nature of my work. Well, "A Lot". 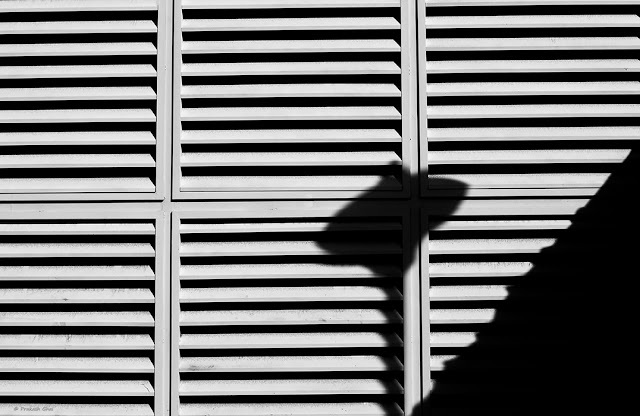 But, Minimalist Photography has really has helped me discover my inner creativity. I shoot mostly on Sundays. My hobby helps me achieve a weekly de-stress and prepares me for the next week of monotony. Without this creative expression, I would have completely fallen apart or I would have forced myself to completely leave business and get into creativity. Right now, I have maintained a fine balance between my hobby and work. Photography has helped me make friends with a lot of like-minded creative people and it feels way better than at work, when I am out with them. Earlier I was using a .blogspot.in domain extension, which was probably not the right move. I had an year long discussion with a friend of mine on this. Now, I realize I should have switched to a custom domain name much earlier. Well, better late than never. Maybe someday, I would do a long post listing the benefits of using a custom domain name for a blog. But for now, Bye. I wish you all a great day. 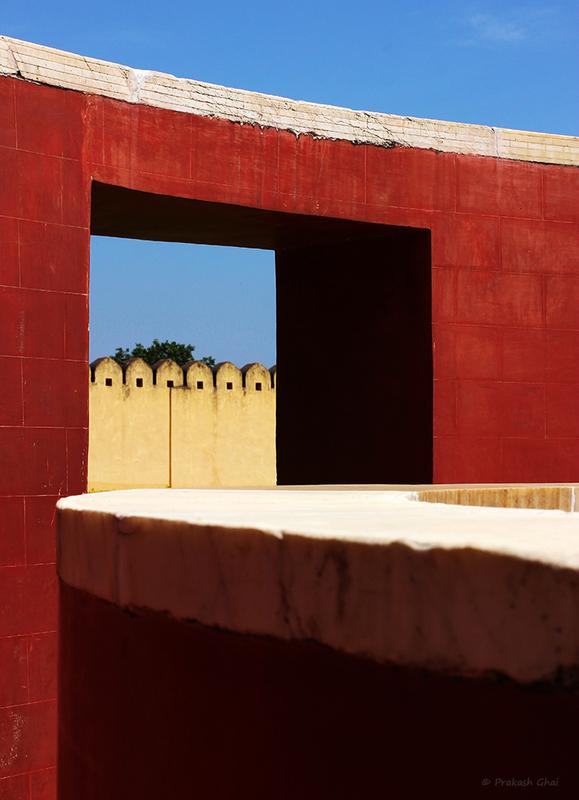 Apart from Jawahar Kala Kendra, that I keep mentioning in my posts, this place "Jantar Mantar" is my second favorite in Jaipur. The reason is simple. The place is full of colorful, geometric astronomical instruments. The primary colors that one would find there are, yellow, red, brown and whites. That makes for a really nice color palette. And of course if you choose to add the blue sky, like how I did above, then its even better. Well, as you can see, I have categorized this picture under "Minimalism as in Repeating Shapes", rather than "Minimalism as Less Elements". The reason is, that the 6 arcs in repetition (part of the yellow wall) is my primary subject in the photo and everything else around it has been used to redirect the viewers eye to it. For examples, the curve coming in from the right, points nicely to it. Also, the two rectangular frames around the arcs, gives them core attention. There are these other types of "Minimalism as in Repeating Shapes" where the shapes in repetition, encompass the entire frame and thereby does away with the distracting elements. Thus, reflecting core simplicity. One such example on it from one of my previous posts is "Surrounded by Greed". So, those shots are also valid along with these kind of "Newer" Minimal of Repetition shots. Of course these are more interesting. But mind you, a very very clear redirection of the viewers eyes to the core subject is required, so you have to hit the bulls eye every-time. Such compositions, I call advanced Minimalist Visual Art. Because, here you try and challenge the definition and types of minimalism, by bending the rules, by being more creative and explorative. And at the same time, you still managed to stay within the rules. That is this thing about art. We have to keep experimenting, otherwise we shall always remain within a shell. Composition: The photo falls under the "Minimalism as Simple Geometry" category. Simple geometry being, umpteen lines, and the right-angled triangle on the bottom right. The main element is the shadow of the lamp and its unique placement. It falls right on the intersection point of two big lines and sits at the very edge of the diagonal line of the triangle created by the strong shadow. Location: Near Ravindra Manch basement parking area. Jaipur. Opposite to the Jharkhand Mahadev Temple in Vaishali Nagar, there are a few bright colored houses. These houses are inhabited by the workers working in the temple. There is an area right opposite the front gate of the temple, where pigeons are fed. Usually, one would find at least 200-300 pigeons there. The visual arrangement that you see in the picture below, is right above that pigeon area. I visually connected the front wall, added the metal diagonal coming in from the right and placed the pink house in the background, along with its unfinished brick wall neighbor. It is a very tricky composition and I had to crop out a lot from the original photo. Like for example on the bottom right, there was face of a girl painted in black, that was a spoiler and hence I removed it. All that you now see in the frame with focus is Simple Geometry. It is everywhere. So many lines and simple geometric shapes. I also wanted to keep the colors to a minimum and I think the photo would even looked better without the vertical blue line, right under the metal diagonal coming in from the right. What do you think? Should the blue line be there?